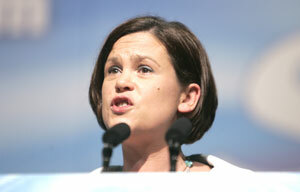 SPEAKING at a TEEU annual conference in Cork on Saturday, 22 November, Sinn Féin MEP Mary Lou McDonald made a rallying call for trade unions across the state to unite on the demand for a social progress clause to be included in any future European treaty. “The Lisbon Treaty debate is not over,” she said. “Yet the Government still refuses to take the people’s mandate to Europe. The Taoiseach and Foreign Minister have refused to negotiate with their EU peers. Brian Cowen’s main concern has been to save face with the top tier of Europe rather than assume his role as a leader of a progressive state that has a vision of a better Europe. “In the absence of leadership from government it is the people of this state that must be the voice of Ireland’s vision of a better Europe. We are all ambitious for what can be achieved. The trade union movement demand for a Social Progress Clause to be included in any new treaty is just one example of this ambition. “Workers across Europe have a right to decent work, to equality. They have a right to organise and campaign to improve their lot at work. They have a rightful expectation that the law should recognise and vindicate these rights. “To date, the government has refused to address the issue of workers’ rights with regard to the Lisbon Treaty despite the issue being highlighted as a key concern throughout the campaign and in the Government’s own post-Lisbon research. This is no real surprise. Fianna Fáil has never shown any commitment to ensuring workers get a fair deal. “The Government’s record to date in the areas of workers’ rights and public service provision has left Ireland languishing behind the very EU partners the Taoiseach is so desperate not to upset. “Following their rejection of the Lisbon Treaty, the TEEU has an opportunity to lead the charge in the demand for a social progress clause in advance of the December EU Council of Ministers summit. Fianna Fáil will never willingly make the demand of Europe for the clause but the trade union movement can leave them with no choice if it coalesces on this issue.